The long, hot, dusty days of mid-summer have given way to cool nights, crisp days and the approach of that universally beloved season: Fall. We had our first snow in the highcountry over Labor Day weekend, and now (thankfully) we're back to sunshine. My big recent adventure was the Logan-to-Jackson (LoToJa) bike race. It was a fantastic event, but I'm still awaiting digital pictures (c'mon Wade!). 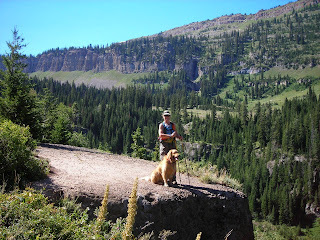 So, in the meantime, here's a recap of other recent outings around the home base of Driggs and Teton Valley, Idaho. Our Aunt Cecile, Uncle John and a couple of never-before-met second cousins from Pennsylvania paid us a quick visit two weeks ago. 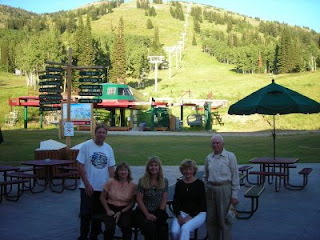 We took them up to Grand Targhee for dinner, and enjoyed a balmy evening sunset overlooking the ski hill. They continued on to Yellowstone the next day, but it was great getting to know them. John keeps me laughing, they're great people. I oversaw a huge work project here in Teton Valley a few weeks ago. 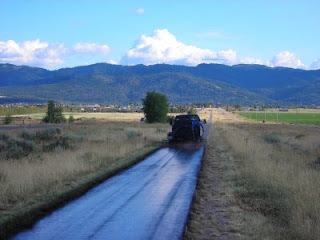 The main part was repairing and sealcoating the Victor-to-Driggs bike path, which went very well. Many thanks to my man Garth for coming up from Salt Lake with the equipment, and the hard work. That pathway is a priceless asset for this community, and hopefully it'll hold together for a few more years now until we seal it again. Winters around here are not easy on pavements. Before we got so into mountain biking, Joanne and I hiked a lot. The hiking outings have decreased over the years, but the Darby Canyon Wind Cave hike is still something we try to do every summer. It offers great scenic variety, enough of a climb to be a workout (about 2,000 feet), a perfect distance (about 4 miles in), and of course the unique Wind Cave payoff at the end. The only drawback with this hike anymore is that it has become more popular each year, particularly on Saturdays...which, of course, is when we happened to go. Nonetheless, it was a beautiful day and very worthwhile. 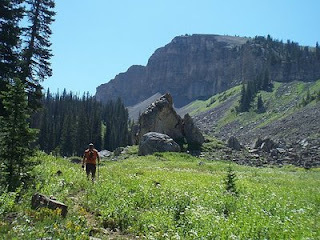 We continued up beyond the cave for another mile or so, taking in the high country views. It's harvest time around here, and we are now officially farmers. 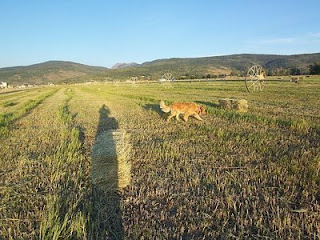 With Hay prices going through the roof, we went ahead and cut and baled our pasture ground for the first time. It's 20+ tons of hay we don't have to buy this winter...plus it validates the moving of sprinkler pipe we did all summer. Bridger can't figure out where all the nice tall grass went.